Can be compared with the Institute for Applied Autonomy's "Pamphleteer"
But you can ask yourself; can machines be happy? Do machines have a hedonistic side? Are machines not just empty shells who wait for a command from above (the command from the human)? It happens a lot that artists give their machines a anthropomorphic touch. Think about Pamphleteer from the Institute for Applied Autonomy (IAA). 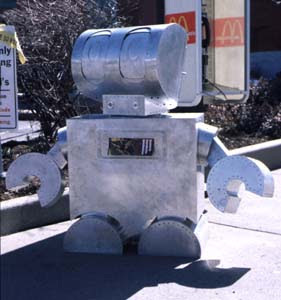 They created a robot that distributed pamphlets. So in short, we human beings accept more from a computer than from ourselves. What does this mean? Creating human-like objects is not something new. Think about the Greek myth of Pygmalion. He was a sculpture who felt in love with a statue he had created. He asked the Gods to make her come to life, which Aphrodite granted. But we also have the stories of Frankenstein and Der Golum. It seems that since the existence of mankind (or womankind) humans have been fascinated with creating the representation of themselves. We want to be like God. We want to create our own replica. And because the use of mud and wood seems to be ineffective for this aim, we have focused ourselves on machinery. Technology. But even though a robot may look like us, talk like us and behave like us, I don't thinks it will ever be like us. It is missing that one thing we don't really understand ourselves: a soul. No algorithm, how intelligent it may be, can cross that gap. Or can it?